The following applet show interaction force between a circular current loop in magnetic field generated by a magnet. Red arrow show the direction of the current. Blue arrow are force due to current loop in magnetic field generated by a magnet. You can change the location of magnet with two sliders (move in y/z direction). The radius R of the current loop can be changed with slider,too. Click play to trace out the magnetic field lines (produced by magnet). chance to check it out and enhance it? thanks! It should be fixed now. Please check it again! bug when z =! 0.
by the way is it that the codes to draw magnetic field lines is hard that the reason why i haven't seen much magnetic field lines in Ejs applet? i being thinking i need to add magnetic field lines one day on all my other applets because the sg syllabus still mention it. or should the syllabus be changed to include field vectors to replace field lines? Bug for z!=0 is fixed! should the syllabus be changed to include field vectors to replace field lines concept? It is much easier to calculate the field vector. However, the simulation need to following the field vector in order to draw the field line. It might be easier for students to visualize magnetic field line than magnetic field vector. I think It does not matter because the field lines is just the line of force if there is a particle that is affected by the field lines. Starting from the N pole has some advantage when we explain it to students. Can add the field lines arrows too to make the visualization of field lines consistent with the convention adopted by textbook? However you think this point no make students mix or someting like it ? The purpose of the above applet is to show the force on a current loop in a magnetic field. The magnetic field line is a by product. So all the magnetic field line pass throught the current (event when magnet is off-axis). That is the reason , the field line starts from the current loop. 1. remove current loop and other. 2. let field line starts from N pole. 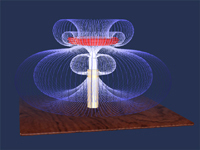 An interactive Java 3D applet field shows the field configuration around a non-magnetic ring as it falls under gravity in the field of a fixed magnet. In the initial configuration the coil has no resistance and levitates in the field of the magnet. Hit run and let the ring bounce several times. At the bottom of a bounce hit the "iron filings" box to see a representation of the complete field. Hit run again and increase the resistance to "10" using the slider. Watch the subsequent behavior of the ring. this The Falling Coil Applet by MIT has a special button on the middle right, it is called magnetic field lines by iron filing. i think it is drawn using a techniques called line "Dynamic Line Integral Convolution for Visualizing Streamline Evolution"
The way they did it was by using a plane, to allow such a visualization . I can't understand the mathematics, maybe you can explore if it can be done on Ejs! Thanks! Pedagogy wise, it is a good visualization feature to have, because it allow students to relate back to real life "iron filing" representation of magnetic field lines. yes, i tried to change the codes to make it possible to change the number of lines, i think it was some np or something, if i start with 2, it draw correctly. but when i add slider to control it, it was some new errors i have no seen before and it was stuck for a while. the final goal is i hope to make it like the MIT TEAL applets visualization, which i should be able to do more it i can figure out the codes better, like the vernier caliper model, DC motor etc. nc is the number of coils for the calculation. np is the number of points for each coil for the calculation. Number of filed lines are defined by nf (default=24). You might be able to change it to smaller value. However, you can not change it to larger number without redefine all those array for (xf,yf,zf,...). You need to redefine the default for nf if you need more number of lines and do not forgot to call _initialize(). I can't see the image. Please help me. Thank you.